An installation shown at Boulder Museum of Contemporary Art from May 16 to May 22, 2016. The text below is by Mardee Goff, Curator of BMoCA. CryptoTherapy is an installation by Los Angeles-based artist Tim Schwartz that utilizes the front windows of BMoCA. Covering each windowpane with a white sheet, Schwartz has created an opaque layer that blocks any view inwards or out. During the day, the installation exists only as a grid of white rectangles. 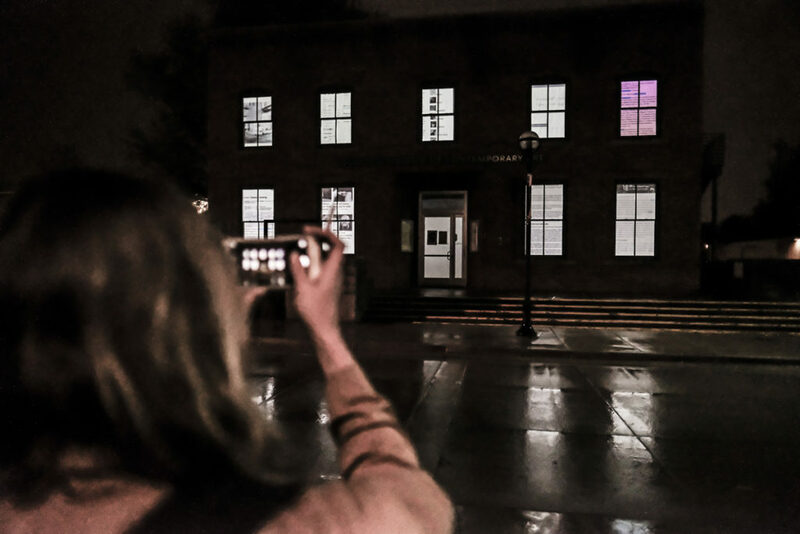 At night, a series of projections give virtual function back to the windows, opening up a new view into the museum from an entirely different perspective. 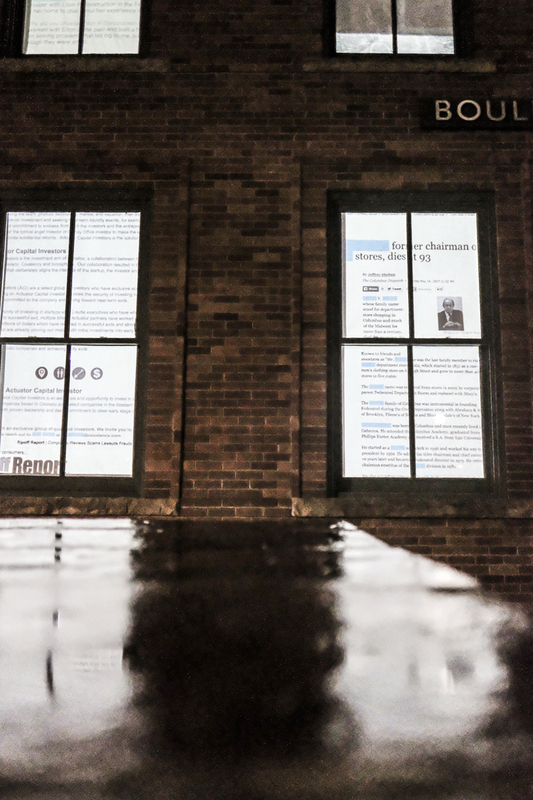 Illuminated by a succession of moving text and images, the window’s white spaces become portals into another dimension that appears zoomed-in and cropped. Peering inside, we find ourselves scrolling through a string of addresses, maps, profiles, and records trolled from the Internet. The visual process recalls the ubiquitous and habitual motions associated with surfing the web, yet the initially random text and images start to divulge direct connections to BMoCA. The projected content, sourced from a series of basic online searches, follows the cyber trail of BMoCA and its social network that comprises individuals from around the world—artists, museum staff, arts professionals, members, donors, tourists, etc. Tracing the digital footprints left by those connected to the institution, Schwartz gives us a data snapshot of the museum and its evolving communities that reveals the online and often unseen construction of BMoCA. 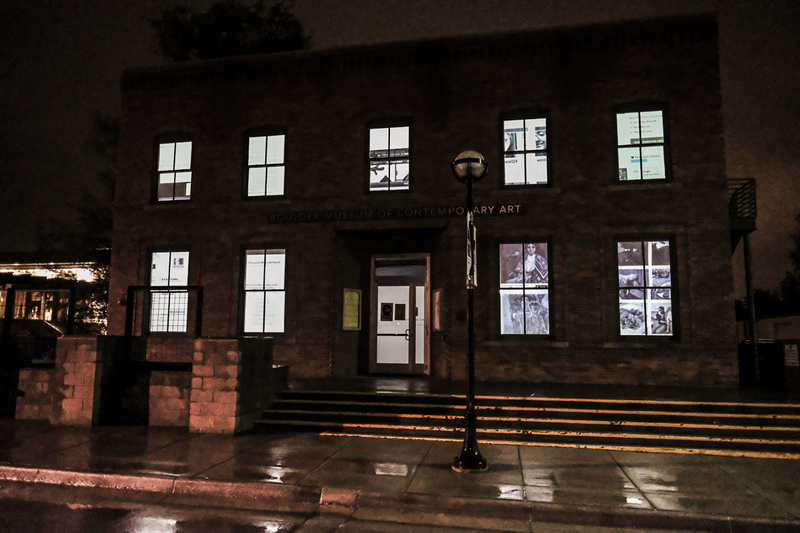 The simple gesture of “whiting-out” the windows emphasizes a clean slate, and within the context of Schwartz’s work cannot help but reference “black outs” linked with government censorship and privacy control. In the projections Schwartz directly employs the technique, blacking out names to make each profile seemingly anonymous, while also referencing an invasion of privacy. We cannot help but feel vulnerable. Like tracks in fresh snow, we realize the individual trails might be our own. Yet, any urge to feel like a victim is overcome by the fact that all of the information projected is not simply public, but it is information we have all willingly provided. More unsettling is that Schwartz has merely skimmed the surface of the information that could be uncovered if someone had the desire to dig deeper. Zooming in and out of individual profiles, Schwartz has created a new style of portraiture not linked to a specific person but a composite of a whole network. Assembled from impressions we may not realize we are leaving, Schwartz has rendered a portrait of BMoCA and its community, uncomfortable in its familiarity. We are forced to reflect on the virtual landscapes built and sustained through willful sharing of information and the network created through connections between constituents and communities. We are all responsible as individuals and organizations who voluntarily expose themselves and their data online. As our virtual reality becomes more and more of an actual reality, we must ask ourselves: what impression are we leaving for a future society? What portrait are we painting? The Spring 2016 Present Box exhibition, Tim Schwartz: CryptoTherapy, is presented as part of MediaLive 2016.